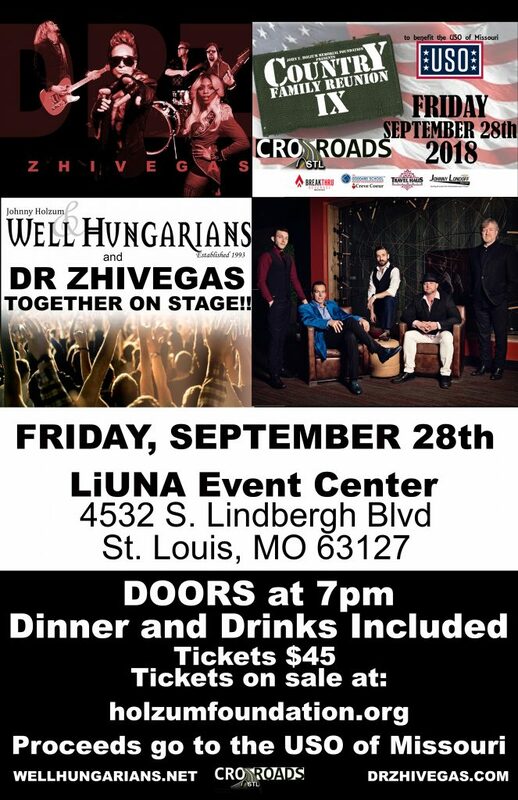 This year we are proud to present CROSSROADS® STL, a show featuring Well Hungarians and Dr. Zhivegas on stage together, AT THE SAME TIME! Don’t miss this unique show featuring two of Saint Louis’ top bands performing each other’s music along with some surprise performances! This event benefits our military troops, with proceeds going to USO of Missouri. USO of Missouri, Inc. is a private, non-profit organization, whose mission is to lift the spirits of America’s troops and their families by providing a “touch of home” through their facilities, a shoulder when needed, and fun family events. They provide services at Lambert International Airport in Saint Louis, Scott Air Force Base near Mascoutah Illinois, Fort Leonard Wood, and any smaller airport in the Saint Louis/Metro Illinois area that welcomes our military. USO of Missouri is a non-profit 501(c)(3). They receive no government, military, or United Way funding and are not part of the Department of Defense. All funding comes from individual and corporate donors! Please consider donating monetarily with a corporate/business sponsorship, or with items for raffles and auctions. We are seeking corporate partners to sponsor the entire event, and corporate sponsors for different segments of the event. Feel free to contact us regarding full sponsorship of the event. We appreciate your participation in this wonderful event to help our troops. Sponsorship at this event will place you in front of a favorable middle and upper class demographic. Sponsors will enjoy a huge social media presence. The amount of Facebook “friends” and “likes” from all of the bands, the venue, and the benefactor are limitless! Add to that Instagram, Twitter, Google +, Snapchat, etc., and artists mailing lists, and you will be seen by tens of thousands of demographic specific customers! The event will receive live radio mentions in the Saint Louis market on KTRS, KMOX, and WIL, and television exposure on FOX 2, and KSDK. So far we’ve been able to help….